As summer starts to wind down, you might be thinking of getting away for one last hurrah! But if you want to save, you'll need last minute trip ideas that fit your budget. I get it. We all get a bit of wanderlust at the end of the summer season. After all, the days are only going to get shorter and cooler. Work’s going to pick up and it’s tougher to get away in the fall. The good news is that the end of summer is a great time to save on last minute trip ideas. Here's how! Many deals come up at the end of summer, especially when school starts and families cut back on travel. 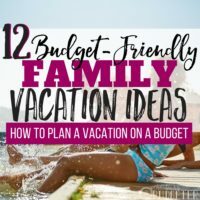 If you don’t have kids if or your kids aren’t school-aged yet, late summer’s a great time to take advantage and explore last minute trip ideas (on a budget). My husband and I got married at a casino in Atlantic City. We stayed at the Tropicana…and get this: we found an awesome deal where if we gambled $20/day we could actually get free rooms. Literally, a beachfront hotel for less than $10/day! Now, I know not every spot has deals that awesome, but if you can find airfare on the cheap, it’s a great time of year to go hit popular tourist-friendly destinations. Spring break is long gone and most locations are seeing summer traffic wind down. They’re hoping to end the season on a high note, so they'll often offer great deals to keep vacationers coming. If you’re considering a late summer trip, it’s a great time to go! Check out these tips for last minute trip ideas on a budget. The first issue to address before you even start planning is should you really go away? I know this is a tough question, but hear me out. No matter where you go and how great the deals are, if you can’t afford a vacation right now, you shouldn’t go. If you must put the trip on a credit card or go into debt, don’t do it. It’s not worth it. There are plenty of other options for escaping and having fun much closer to home without breaking your budget. A vacation is NOT an emergency. I want you to be realistic. Vacations, even last-minute trips on a strict budget will still cost you money. You’re going to go out to eat. You’re going to buy treats at the pool. You’re going to spend money. It will happen, people. 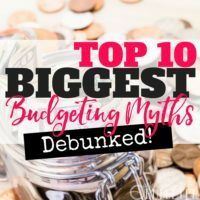 If you’ve got a little wiggle room in your budget, you can travel very cheaply, but don’t go into debt. You can take a day trip or explore in-town. Postpone your travel until you’re facing more financial flexibility! 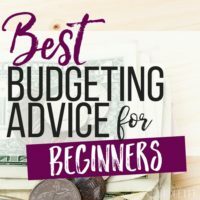 Before you go away, you need to plan and budget exactly what you can afford to spend. This is critical in determining whether you can afford a hotel or if you need to camp, whether you should bring your meals or eat there (more on this below), and what activities you can afford to explore. Sit down with your budget and look at exactly how much flexible/entertainment spending you’ve worked in. Then subtract transportation and lodging. With the amount left, divide by the number of days you’ll be away and that’s your daily budget. Do not go over this amount. If you only wind up with $20/day, you may need to bring all meals with you, plus a deck of cards to play at the beach. Plan ahead so you stay within your budget parameters. One of the best pieces of advice I can give you is to eat-in as much as possible. Eating out is one of the biggest budget busters, whether you’re at home or on vacation. Cut back to one meal out per day (or less) and you'll save a bundle! If you’re traveling by car, pack a cooler with sandwiches, drinks, chips, veggies and dip, and breakfast bars for fast, cheap meals. If you’re going by plane, find a grocery store near your hotel and stock up your fridge with easy snacks and meal items. Opt for shelf-stable foods like peanut butter or easy packs of tuna salad—food you can simply throw between bread and eat. Another great saver is to plan your “eat out” meal for lunch, when prices are cheaper. Eat a simple breakfast and then watch for all-you-can-eat buffet options for lunch (or even brunch). Eat a big lunch and then enjoy a light dinner of snacks and munchies in your hotel later. If you’re dying to get away but want to avoid paying for lodging, look for locations where accommodating friends or family live. This doesn’t work for everyone, of course, but if your pals live in a fun spot to visit, see if they’re willing to put you up for a night or two. Ease the burden by being a low-maintenance houseguest, particularly if you’re visiting at the last minute. Provide your own transportation plans and entertainment, especially if your friends or family work during the day. Visiting friends is a great way to save on last minute travel but don’t take advantage of their hospitality. If you want to save on last minute travel deals, consider following your favorite airlines on Twitter and other social media accounts. Airlines often post travel bargains on their accounts, so if you’re following you might score last-minute airline tickets for cheap. Watch sites like Kayak and Priceline for deals, particularly if you’re flexible with travel times, dates and even locations. Some airlines will offer discounted fares to fill up their flights, so this method works particularly well with big city “hub” airports like JFK, O’Hare, Las Vegas and Atlanta. If you’re willing to take a flight in the middle of the week, during red-eye times or deal with long layovers, you might find better deal options as well. Watch for discounts for students, veterans or military personnel, senior citizens and other groups. Check for any airline points you may have acquired and look for discounts through services like AAA if you’re a member. Pack light to avoid paying fees for extra baggage. Some airlines even charge for a carry on, pack economically. For a weekend away, you may be able to get away with a few clothing items and toiletries. Only bring one pair of shoes, wear a comfortable pair of jeans, and bring an extra top or two and underwear. For longer stays or more involved trips, you might also need a dressier outfit, a bathing suit or other items, but always aim to bring as little as possible. Another way to save is to avoid packing in too many destinations and activities into your last minute trip. A last minute trip isn’t the time to explore up and down a coast or travel through SeaWorld, Disneyland and Universal Studios. Pick one focus for your trip. If you plan too many destinations and activities into your itinerary, you’ll need to rent ground transportation, spend extra on entrance fees and activities, and you won’t feel as relaxed or refreshed at the end. Save the multi-leg trips and jam-packed marathon itineraries for trips where you’ve got more time to look for the best deals and plan your course of action. For last minute trip ideas on a budget, go for simple plans. Visit one city or a certain neighborhood and really explore it as your home for the weekend or few days away. Another important way to save on last minute trip ideas is to plan to navigate on foot as much as possible. This isn’t so easy if you’re visiting a small town or a rural destination, but if you’re visiting a city, simply explore on foot or use public transportation. Most cities offer bike rentals, as well as access to Uber, Lyft, buses and rail systems. Explore what your destination offers and keep your itinerary foot-friendly. If your hotel is near a beach or lake, there’s really no reason to leave and set off on an adventure! Save your exploration and adventure for longer trips where you’re able to do more advanced planning. Save money on lodging by checking out Airbnb options at your destination. For those of you who haven’t tried Airbnb before, it’s a really great option! You'll enjoy the accommodations of a house rather than a hotel and you'll get an “insider’s view” of your destination. Airbnb is often much cheaper than a hotel as well. Airbnb doesn’t offer the full-service and concierge of a hotel, of course, but usually the options are very charming and comfortable. Rather than splurging on accommodations, use your money toward activities and fun on your trip. After all, you’re probably not going on a vacation to see a hotel room. Go cheap on your lodging and spend on activities. Look for deals like we found at Tropicana. Many casino hotels offer really awesome savings because they want you to stay in their place and spend money in their slots. You don’t need to be a high roller to take advantage of these deals. Simply aim for the minimum and enjoy the benefits. If you can’t find a great destination to fly to without blowing your budget, consider a road trip as a last minute trip idea on a budget. What’s within driving distance from your house? If you can find a campground, tourist-town or even a city to explore while avoiding airfare, hitting the road is a great option for getting away fast. If you’re traveling in-state, look for local savings as well. Check Groupon and any special deals for events in your city or neighboring towns. Many of us live within 6 hours of a major city, so a quick trip is a great chance to explore and enjoy a vacation feel without having to spend the time at an airport. Plan your trip and look for fun stops along the route. Make the time on the road half the fun of the travel! Bring snacks and great music to play while you drive along and explore the sights. When you get to your destination, follow the same rules above to save. Eat-in as much as possible, set up basecamp in a central hub and explore on foot rather than driving around searching (and paying) for parking in an unfamiliar city. Getting away for a last minute trip is a wonderful way to end a memorable summer. 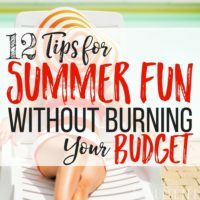 With a little planning ahead and working out your budget before you go, you’ll get plenty of vacation vibes and relaxation in. You don’t need to spend a lot to have a great time. 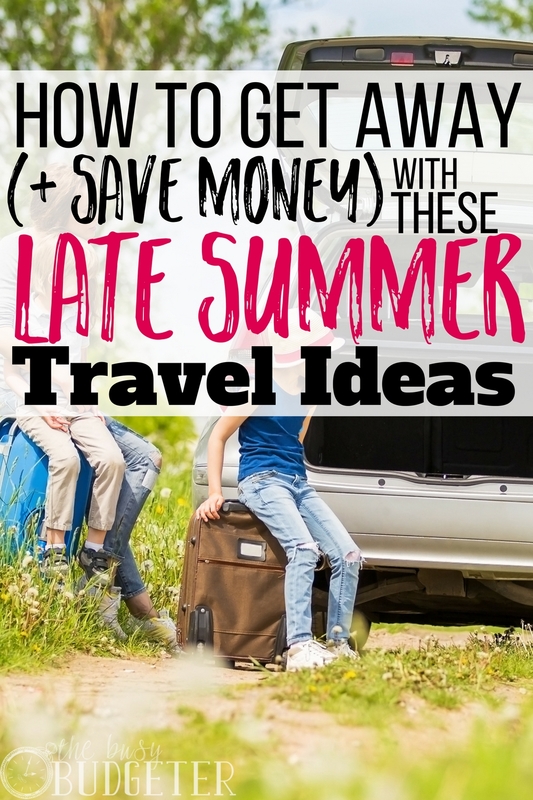 Watch for deals and use smart strategies to help you save on these last minute trip ideas for late summer travel! How do YOU save on last minute travel? What’s your favorite late summer destination? Before we had our son, my wife and I used our point from our Marriott credit card to get our hotel stays free. We went for the mid-range hotels so our time there was comfortable but didn’t blow a ton of points. Great tips, Rosemarie! PS: I featured you in my post today! And yay – thank you! I definitely make my own breakfast when I travel. Hotel meals can be quite pricey so I avoid them and find more affordable options elsewhere. Supermarkets have lots of great ready-to-eat pre-packaged or canned options. Combine those with fresh fruit and you’re good to go! Great advice! We have dates blocked for our vacation and the budget set, but cannot pick a place to go! I love the idea of taking your own food and airbnb for cheaper travel. I think that would feel more homey anyway! Now to decide where to go!! I love that you began with stating the obvious: if you can’t afford it, just let it go! My door is also open whenever my loved ones feel like visiting for a few days or even weeks. If we enjoy each other’s company and can save a ton of money on accommodation, why not take advantage of the opportunity? I have never tried an AirBNB! I need to dive in and go for it! Last minute road trips are life! The warning about restraining ourselves from going in debt is truly profound. It’s not much of a vacation if you have to go back and work twice as hard and twice as long and feel like you can’t make your bills that months. Most important thing when it comes to travel or taking that last minute couple of days off is to know both in your mind and heart that you can really relax. I know that I personally can’t take a break if I know that what I’m doing will cost me in the future. Thanks for all of these awesome tips Rosemarie. ? You’re the best! Thanks for this instant ideas before tour. I think a tour place is having all the amenities also. So, if you forget something than it is not a big problem. At least a tour is providing you an exciting time spend.